European Space Agency satellite pictures had indicated last week that cracks were starting to appear in the bridge. 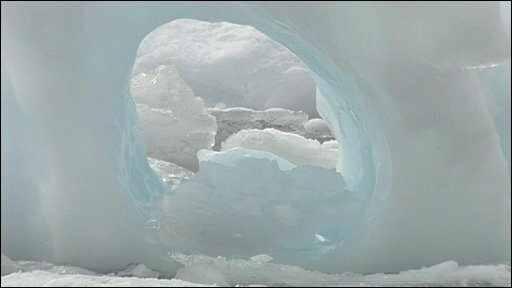 Newly created icebergs were seen to be floating in the sea on the western side of the peninsula, which juts up from the continent towards South America's southern tip. 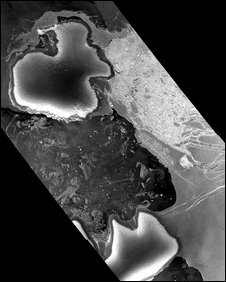 "We know that [the Wilkins Ice Shelf] has been completely or very stable since the 1930s and then it started to retreat in the late 1990s. But we suspect that it's been stable for a very much longer period than that," he told BBC News. "The fact that it's retreating and now has lost connection with one of its islands is really a strong indication that the warming on the Antarctic is having an effect on yet another ice shelf." Such acceleration effects were not included by the UN's Intergovernmental Panel on Climate Change (IPCC) when it made its latest projections on likely future sea level rise. Its 2007 assessment said ice dynamics were poorly understood.